Hi All!! I am back after a long long break!! I missed you all a lot !! I know my reading list is miles long but slowly and surely I will read all of them. 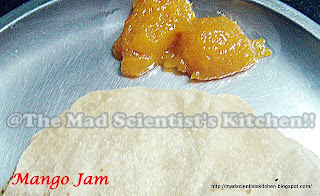 In Rome like Romans be so this time I decided to make "Ambe che Satt" or Mango Jam. A typical Goan preserve of mangoes. Knowing my family's dislike for sweets I brought only two Mussara mangoes, these are special kind of mango available in Goa for jams. I also added one Alphonso as I could not resist it. 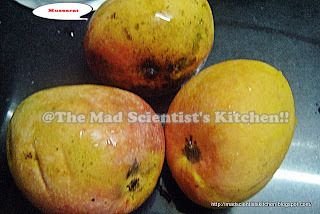 Transfer the pulp of the mangoes in a thick bottomed pan. (I used the pressure pan). On low flame heat the mangoes. Stir constantly. Please be careful as the jam bubbles and splatters. The burns from the process are painful. When the pulp leaves the sides of the pan and becomes a bit translucent add the sugar and stir. Heat for about 4-5 minutes and switch off the gas. Let it cool a bit in the pan. Transfer to a steel container. I am told that it lasts for about a year in out of the fridge but I am not taking any chances and hence it goes in the fridge. 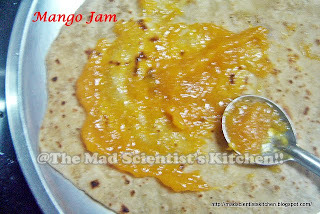 Lovely looking mango chutney. Lop smacking delicious. Nice and wonderful jam !! that too with mango !! love it !! 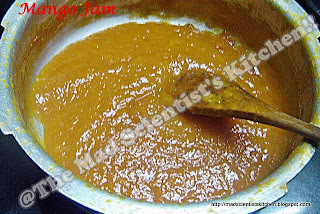 yum yum...mango jam looks great..wonderful recipe.. Welcome back dear :) The jam came out perfect, love homemade preserves! Wow that sure looks yummm! Yum ....home made mango jam sounds so great .. Thanks guys. Glad to know I am not forgotten! !